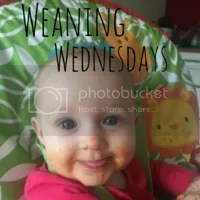 Hi and welcome to the second ‘Weaning Wednesdays’ I was so pleased with all the link ups last week. Thank you to everyone that joined in. A special mention to Feeding Finn and a brilliant post on one month of BLW with lots of links to some great recipes. My Little Babog Blog for the yummy looking porridge oat biscuits that I’m going to try this week.